Did you ever dream of quitting your day job and traveling the world? If so, there are now literally thousands of travel blogs online dedicated to helping you make that dream a reality. Anyone looking for a good place to start their globe-trekking adventure should check out these top 10 travel blogs. All of the blogs listed below have incredible travel hacks that will help you plan your next vacation. We start our list of the top 10 travel blogs with Ben Schlappig’s One Mile At A Time. This blog mainly deals with topics like different airlines and sky miles and currently has the highest Internet traffic for any travel blog. Mr. Schlapping was born in Germany, but he often traveled from Frankfurt to Tampa as a boy. At a young age, Schlapping developed a great interest in international travel and he quickly discovered how he could use sky miles to help him travel the world on a budget. Schlapping is perhaps best known in the travel industry for serving as the Vice President of FlyerTalk. Since he founded his blog in 2008, Schlapping has flown at least four million miles around the world. If you’re interested in all things related to airlines, sky miles, and special travel promotions, there’s no better blog to check out than One Mile At A Time. Mark Wiens’s Migrationology is the best travel blog for foodies. Even if you haven’t visited Wiens’s Migrationology website, you’ve probably seen a few of his popular travel reviews on YouTube. Although he was born in Arizona, Wiens spent his early years in Albertville, France. He then moved to the Congo where he was homeschooled for three years, and then completed his high school education in Kenya. In 2008, Wiens got a BA in Global Studies at Arizona State University. After college, Wiens traveled around South America and South East Asia, all the while creating Migrationology. Today, Migrationology has well over 40,000 fans, all of whom share Wiens’s philosophy that food can bring people of different cultures together. Wiens’s YouTube page now has an impressive one million subscribers. Jonathan and Kach Howe created Two Monkeys Travel Group in 2013. While the Englishman Jonathan was traveling through Laos he met Philippine Kach who was traveling with her brother. A few months later, Jonathan got a job teaching in Vietnam and encouraged Kach to join him there. Kach initially planned to just visit Jonathan for a few weeks… but they’ve never been apart since that fateful day. While both Kach and Jonathan have degrees in yoga, they love documenting their travels online to help other explorers. 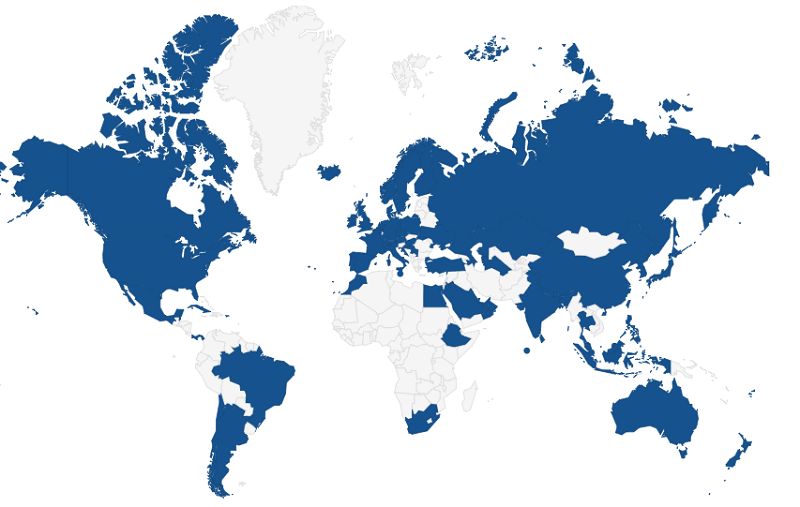 Since they’ve started their blog, Kach and Jonathan have been to over 70 different countries. In 2009, Robert Schrader was claiming unemployment checks in Texas. Today, he owns one of the top 10 travel blogs on the Internet called Leave Your Daily Hell. All of Schrader’s articles are designed to inspire people who feel like they can’t achieve their travel goals due to financial issues. In addition to travel coaching, Schrader writes airline review articles, destination guides, and takes some of the best travel photos in the business. So, if you’re looking for a bit of inspiration to get you from your day job to your dream destination, check out Schrader’s blog today. Gary Leff’s View From The Wing blog is similar to One Mile At A Time. The main focus of this travel blog is helping people get the most out of frequent flyer miles. Leff is a self-admitted frequent flyer buff and currently works as the Chair of the Nominations Committee at the prestigious Freddie Awards. He’s also considered one of the most knowledgeable commentators on airlines and travel deals on the Web. Anyone interested in connecting with fellow frequent flyer buffs must check out Leff’s View From The Wing blog ASAP. 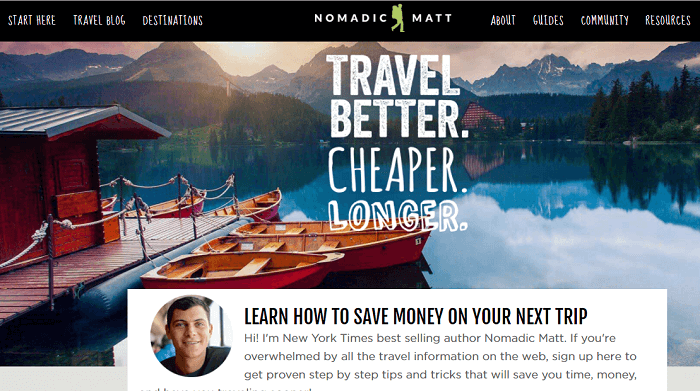 Nomadic Matt’s Travel Site deserves a spot our top 10 travel blogs list, especially for those interested in learning how to travel with just a few bucks a day. What’s great about Matt’s blog is that he doesn’t feature sponsored content or paid trips on his platform. He does his travels just like you would and helps his readers save money while on the road while also reviewing jaw-dropping destinations such as Nicaragua, Morocco, Seychelles, and many other. Matt has also written a number of books and budget city guides and offers four travel courses for enthusiasts. 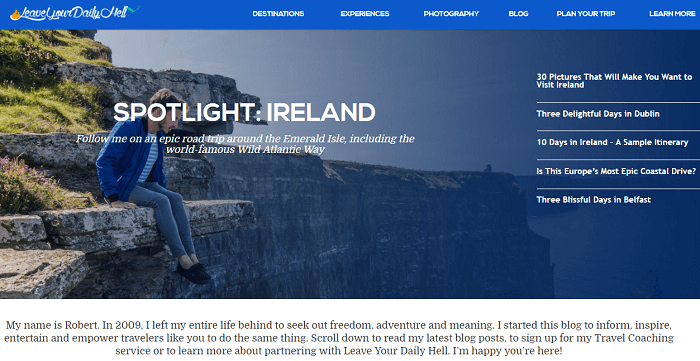 Shakespeare famously wrote, “All the world’s a stage.” Well, the couple Elaine and Dave certainly took that quote a step further when they entitled their travel blog “The Whole World is a Playground.” One reason this blog is consistently ranked amongst the top 10 travel blogs is because it proves how people can travel the world while keeping their day job. Believe it or not, this couple actually travels to 15 different countries every year while holding down high-paying jobs in their native Ireland. Just a few of the countries this couple has explored include Bulgaria, China, Egypt, and Israel. It’s not really hard to see why South East Asia is becoming such a hot spot for tourism. The prices are cheap, the weather is perfect, the beaches are pristine, and the people are friendly…honestly, what’s not to love in South East Asia? Anyone thinking about traveling here for the first time should definitely check out the South East Asia Backpacker blog. Nikki Scott founded South East Asia Backpacker in 2009 as a print magazine. 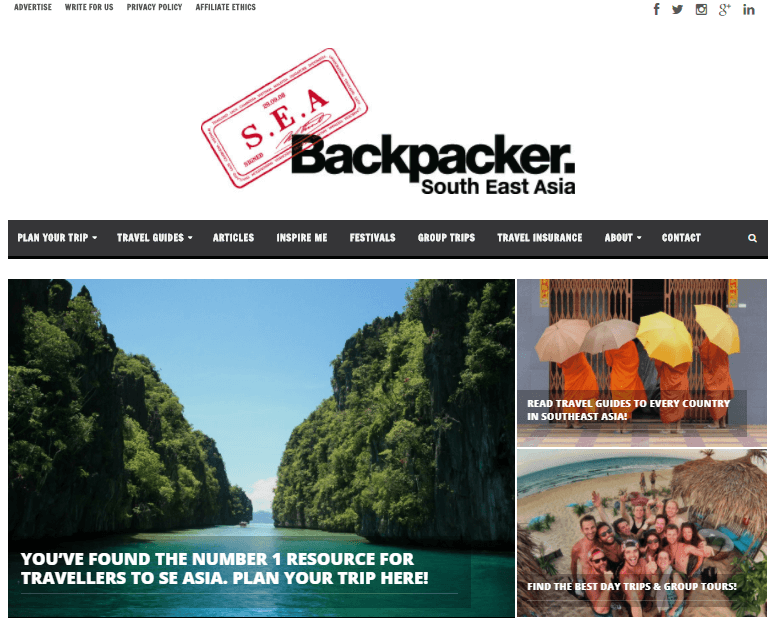 Since that time, South East Asia Backpacker has become one of the top 10 travel blogs for people interested in this part of the world. Whether you’re going to the Philippines, Singapore, Thailand, or Vietnam, you’re sure to find tons of information on this website. The couple Vid and Savi created Bruised Passports to share their extensive travel history and to promote their “rose tinted glasses” philosophy. Both Vid and Savi believe in always questioning conventions and trying your best to see the positive side of life. Just a few of the 75-plus countries these lovebirds have visited include Mauritius, the Czech Republic, and Costa Rica. Anyone into fashion will really admire this travel blog, since Savi frequently posts fashion article from different places around the world. Closing out our list is Japan Travel Mate. As you could tell from the name, this travel blog focuses exclusively on travel to the “Land of the Rising Sun.” Since Japan is such a tourist hot spot, it really merits its own travel blog. Dean Wormald first traveled to Japan in 2009, and ever since that time he’s fallen in love with Japanese culture. He created this blog to help others appreciate the richness of Japanese culture and to help first-time travelers get the most out of their Japanese excursion. If you’re a fan of all things Japan, then the Japan Travel Mate blog is right up your alley. Any of these top 10 travel blogs will teach you a great deal about financing and enjoying global travel. One of the great benefits of living in the modern age is that we can travel literally anywhere so long as we have our passport and a boarding pass. If you think you can’t travel for whatever reason, the above blogs are filled with stories of ordinary people overcoming their financial hardships to travel wherever they want to go. Read through these travel blogs to discover how you too can travel the world in style.